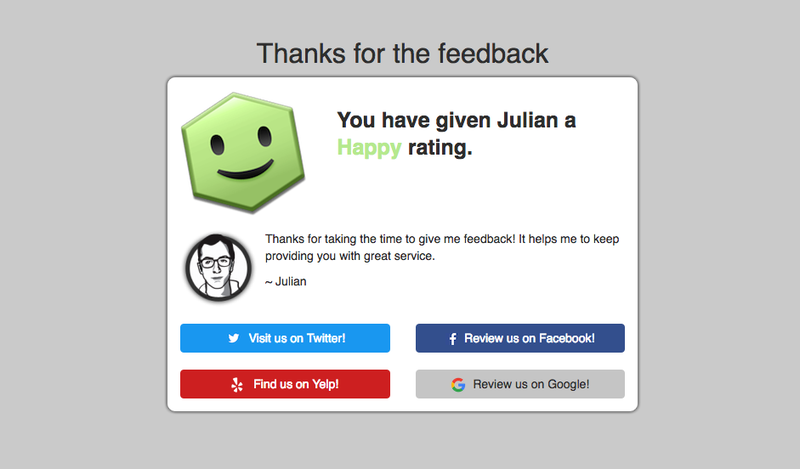 One of the most important things your customer will see as part of the rating process is the “Thanks” page which displays when they have finished leaving a rating. There’s a great opportunity here to interact further with your customers so the Hively team is very pleased to announce a new feature: Branded Thanks Buttons! Branded Thanks Buttons are similar to our regular Thanks Buttons, but have the look and feel of the site that they link to. This adds to the visual appeal of the buttons while also making the buttons more familiar to your raters which might make the rater that little bit more likely to go ahead and click the button! Currently, we have branding for FaceBook, Twitter, Yelp and Google. You can have as many buttons as you like and you can choose whether or not these buttons appear on positive, negative or all feedback. If you’re an admin just log in and choose “Thanks Buttons” from the drop down list at the top right of the page and you’ll find everything you need to customise your Thanks buttons. Of course if there’s something else you’d like to see as a feature in the Hively app, we’re always keen to hear your ideas!